The Balm Mary Lou Manizer is one of the most iconic highlighters in the beauty universe. It is almost everybody's ride or die highlighter. While I was using this beauty one fine day, I saw I that I hit pan on it for the first time. I was like hold the phone! I didn't even review this on my blog yet and I already hit pan on this gem. I need to get my life together and do a review ASAP. Luckily I took blog pics way in advance when I first received it. I found them in the archives of my phone and I can now do a thorough review. I know that there are thousands upon thousands of reviews regarding this product, but I want to add my 2 cents as well. Before I start my review I want to say thank you to Tasneem for gifting me this product along with some other goodies for my birthday back in the day. You can read her blog CityGirlVibe here. 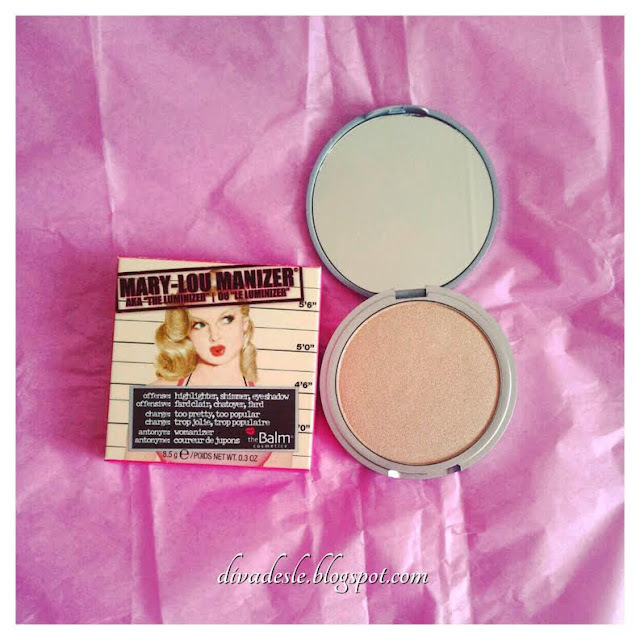 The Mary Lou Manizer comes in the most cheekiest packaging you will ever see. It's a mugshot of a woman with a retro feel. She probably got arrested for being too damn fine! Or her highlight was blinding everyone and she became a danger to society. Either way, she is not apologetic about anything! She is shinning bright like a diamond. This naughty compact comes with a good size mirror and 8.5g of product. It's a perfect size that can be placed in your handbag. The plastic casing is quite sturdy as well. I have travelled with this compact to the Middle East and it really stood the test of time in my suitcase. It's slim and cute. Definitely one of the favourite things in my makeup bag. What makes this highlighter so amazing is that it's a three in one product. It can be used as a highlighter, eyeshadow and all over shimmer product. 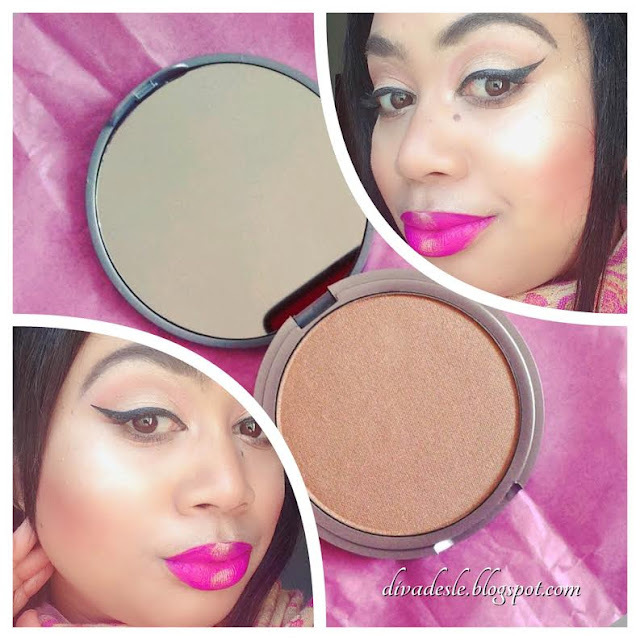 The highlighter has a smooth almost buttery texture. It's not tacky or chunky. It has a silky appearance and glides on the skin without accentuating large pores or scars. The shimmers are so finely milled that it is not grainy or powdery either. The colour is described as a honey toned pigment. Honey tones look beautiful on all skin types. On my skin it gives a gorgeous golden glow. It has a luminous glowing from within shine. It is really stunning on the cheekbones. The result is a crisp illuminating pigment which diffuses light and gives a warm glow. When used as an eyeshadow you can seriously layer on the product. I love that you can build as much golden intensity as you want to. When used with a good eyeshadow primer the luminizer can knock any golden eyeshadow out of the park! Things to note about this compact as well is that it is talc free, paraben free and cruelty free too. How can you not fall in love with this?! As I have mentioned above, the Mary Lou Manizer is perfect for travel. I have travelled with this compact many times and used it has a highlight and eyeshadow in one. Above is one of my signature looks when I want to look glam but have minimal products available. For my travel glam look, I usually place my favourite bb cream all over my face and fill in my eyebrows with a pomade. I then warm up my crease by lightly dusting a blush and bronzer all over it. To add some glam I place the Mary Lou Manizer all over my lids with a eyeshadow brush. I really pack on the colour for an intense shimmery look. I then add liner and my favourite mascara. For my face, I dust some Mary Lou Manizer on my cheekbones and add some blush and bronzer. I also run the highlighter down the bridge of my nose and on top of my lipstick for a more defined glam look. I have this and the other two! I always reach for it. It's that fabulous. Desle, it looks so good on you girl. You rock it! They made highlighters chic before the highlighter craze. LOL Awesome review. The highligter looks AMAZING on you ! WOW !!! LOL the humour in this post gives me life! "I need to get my life together". :) Thank you for the shout out. #HighlightForTheGods Daaayuuuummm! That liner so sharp it can cut a b*tch! I love the look you created! this highlighter looks amazing on you! maybe I applied it wrongly.